Solar Activity Forecast: Solar activity is expected to be moderate. Additional M-class events from Region 1429 are likely. There is also a chance for a major flare and/or proton producing event from Region 1429 during the next three days (07-09 March). Full space weather report below. # Space Weather Prediction Center and the U.S. Air Force. IA. Analysis of Solar Active Regions and Activity from 05/2100Z to 06/2100Z: Solar activity was high. There were five M-class x-ray events during the past 24 hours, all from Region 1429 (N17E31). The largest event was an M2/1n 06/1241Z. None of these events was associated with a CME that would be expected to be geoeffective. Region 1429 dominates the disk in area (about 1010 millionths), and exhibited growth during the period. The trailer portion showed the most development but has separated a bit from the main cluster of spots. The central portion is magnetically complex and shows multiple deltas as well as strong shear along a pair of east-west polarity inversion lines. Region 1428 (S17E08) also showed some growth during the period (area of 280 millionths) but is simple magnetically and was relatively quiet. IB. Solar Activity Forecast: Solar activity is expected to be moderate. Additional M-class events from Region 1429 are likely. There is also a chance for a major flare and/or proton producing event from Region 1429 during the next three days (07-09 March). IIA. Geophysical Activity Summary 05/2100Z to 06/2100Z: The geomagnetic field ranged from quiet to active levels with isolated minor storm periods at high latitudes. ACE solar wind measurements of the interplanetary magnetic field showed steady strengthening during the period and there were numerous intervals of weakly southward Bz. The greater than 10 MeV proton enhancement continued throughout the period and reached a peak value of 4 PFU at 06/1335Z. The flux appeared to be on a slow declining trend at the end of the period. The greater than 2 MeV electron flux at geosynchronous orbit reached high levels during the period. IIB. Geophysical Activity Forecast: The geomagnetic field is expected to be unsettled to active with a chance for minor storm periods during the next 24 hours (07 March). The increase in activity is expected due to combined effects from a co-rotating interaction region with the CME that occurred on 04 March (associated with the M2 x-ray event). Later in the day additional effects are expected due to a glancing blow from the full halo CME associated with the X1 x-ray event that occurred on 05 March. Predominantly unsettled levels with a chance for active periods are expected for the second day (08 March) as effects from the anticipated disturbance should diminish. Predominantly quiet levels are expected for the third day (09 March). 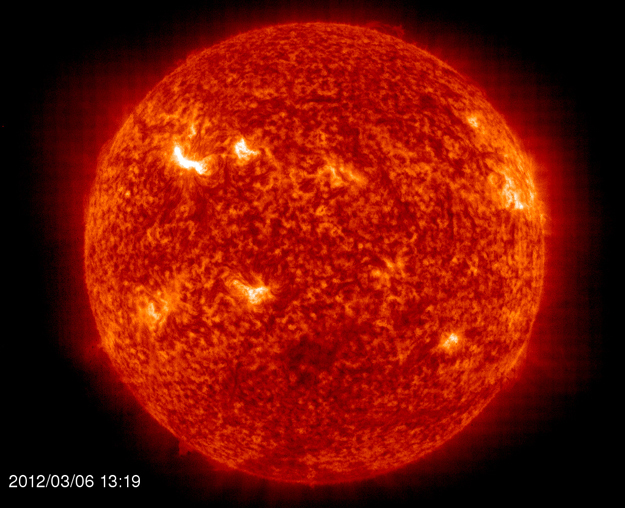 \r\n\r\nSolar Activity Forecast: Solar activity is expected to be moderate. Additional M-class events from Region 1429 are likely. There is also a chance for a major flare and/or proton producing event from Region 1429 during the next three days (07-09 March). Full space weather report below.